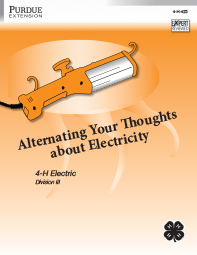 This is a 4-H manual that helps youth learn about and work with alternating current (AC). They learn about the electrical cords that deliver AC to tools and appliances, the materials these cords are made of, electrical cord safety, and types of cords available. They also may make an extension cord, a trouble light, or a poster to exhibit.